Home/Roger Federer/Roger Federer to Hire New Coach? Roger Federer to Hire New Coach? With the 2014 season just around the corner, Roger and his team are having a meeting behind closed doors, and trying to figure out how to solve Nadal and Djokovic at the Australian Open. The Joker makes a sudden appearance in the room. Roger Federer inspired me to take up the sport of tennis. I believe he is the GOAT because I don't see anyone who can better his resume. His loss at Wimbledon 2008 really made me love him and the sport; the only time I watch tennis is when he plays. If you are going to read my posts, be prepared for a thorough technical analysis. I have watched the original, multiple times, really amazing movie! And I´m about to watch The Dark Knight Rises today, love the whole trilogy 🙂 nolan and Bale is a great combination. 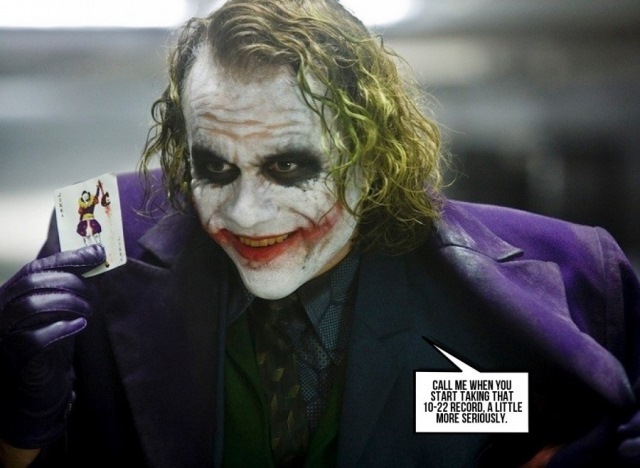 I still think Heath Ledger, as the Joker, is the greatest villain ever, in the history of cinema. Isn’t the Fedal H2H 10-22 now? Lolz, anyway great post Sid, can’t wait for the follow-up post! Has anyone heard that Federer and Godsick are starting their own sports agency called Team8? Del Potro and Dimitrov have signed up already! Hey Conal, just out of curiosity, what does such a company do?? Do they make sure Delpo and Dimi get the best commercial deals or ads? Do they represent them when they are discussing enterance fees for tours?? What is it exactly such an agency does that a personal agent does not do?? And I know Roger will not do much in the company as long as he is playing, but will Tony Godsick now have enough time to represent Roger?? Will he not be too busy?? I think the tournament entry fees are also negotiated through sports agents as well. Sport agency groups such as IMG has a corporate structure, generally meaning a larger group of agents, and more clients able to be handled. Agents can chose to start their own sports agency which is what Roger and Tony Godsick have done. Previously, both of them were with IMG, until their contracts expired sometime ago and Roger felt he didn’t want to renew his contract (or simply IMG shunted him out) so he left, along with Godsick. Hey Conal, thank you for explaining it to me. Nice and brave move of Roger and Tony. I mean, maybe there are already many of such agencies and now they are starting a new one. But I think it will be very succesfull. Afterall, Tony has done such a good job for Roger, I bet more players will want to have that. Maybe we will hear that Rafa will want to be signed too !!! Or does he already have his own company?? For me, I hope Tony will make Roger still his first priority. Hmm, never thought about it…. Roger and Rafa both have a Tony/Toni…..
Sponsors are the main reason why Roger is still playing. @Pablo – http://ruansfedererblog.com/federer-drops-one-of-his-legendary-quotes/ I think this is the main reason why Roger is still playing. Pabtroll lol come on man. Kinda obvious Fed plays for more than sponsors. How many new deals has he signed lately? I can think of 1 in about 2 years. And there is talk of signing McIlroy, as not just tennis players they are interested in ! I’d avoid him like the plague, although he will be a big earner that’s for sure. Great article Sid, and funny too, but…… not as funny as Andy’s acceptance speech when he won last night Britain’s Sportman of the year !!! Come on Roger, wake up, all you have to do is beat Rafa like three times in a row. I promise you, when you do that, no tennisplayer will fear you or think they can just defeat you like that…. Great writing Sid, enjoyed it. 11 days to go before Brisbane tourney starts…..missed everyone from chat room. On a side note, I would like to extend seasons greetings from Happy Hanukkah to Merry Christmas and Happy New Year to all Fedfans. Can’t wait for 2014…..
Hey! And the same to you! Hv a Merry Fedmas! …and a happy new Slam! 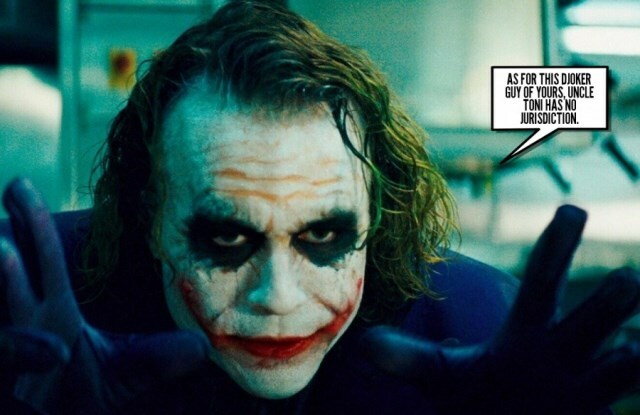 Seems like Federer is taking this very seriously… And we know who’s behind the Joker’s Mask…. The Mission “destroy Nadal” is now officially ongoing! BOUM!!!! You should have done this earlier Sid. Roger heard you and took fast and appropriate measures ! Looks like it was Edberg that hit that winner in the training video. Sid, very amusing. Love the photo of Roger. Interesting interview you might not have seen. Hey Sue, I haden´t seen that one. I think I will look for a job at Credit Suisse or Rolex or at one of the other sponsors Roger has :)that must be incredible to sit there and hear him talk about all those things. That’s a lovely interview. Thanks for posting it Sue. Love Roger’s sense of humour. My favourites too 🙂 Seems odd he would spend a week training with Roger if there wasn’t some further involvement planned. We live in interesting times. Hey Sid, maybe I am the only one, but…. I don’t see that as a “good” partnership. First of all, I have to admit, I never saw Edberg play, but he seems like a too nice guy, just like Annacone. Is that what Roger needs?? I think he needs someone who is not “too nice”, not very impressed by Roger or his legacy. Someone who is tough on Roger…. Someone who wants Roger to win a lot in his last years and not be his “friend”. Don’t know if I have explained my point that good…..
Duh! There’s a “Sportsmanship” award named after him 🙂 Roger simply needs a mind fix. He has the talent, and the skills. And a bigger racquet wouldn’t hurt. Hope dies last, keep praying. Very interesting. It reads very much as though the ball is in Roger’s court (sorry about that – no pun intended :-)). It’s also a little scary, the idea of Roger trying new things, with a new racquet. Could all go horribly wrong and put him off for good which would be a shame. I’d very much like to see a Federer/Edberg partnership. I think they’d work well together and get on which is probably the most important thing. No point in having someone that’s too dictatorial when we know how stubborn Roger is. Stefan might have the right kind of personality to be able to get his point across without offending. A new head, a new way of thinking is always good I think. And of course he does have the skills. Those who have never watched him play should check out some of his matches. The guy is the most talented player ever, he could probably play with a stick of rhubarb and be in the top 50 so I can’t see things going wrong. The only thing Fed fans should worry about is the back. Jonathan, that’s probably correct. We as fans get so carried away with all this big racquet and power thing that we forget that it is Roger’s equipment and unique playing style that has kept his game just about near his best. As tense as this year was for Rog, it was really fun to watch this interview from AO’10. The whole interview is great – but Rog is especially hilarious from 3:45 on. Another great interview. Thanks Alb. I seem to remember he got a lot of stick for his comments about the 150,000 years since a Brit male won Wimbledon. Some people have no sense of humour at all. Precisely. He was just having fun with those journalists, and the hype surrounding the long British wait. Anyone who thinks that Roger was making fun of Andy Murray, or was being condescending, is an IDIOT! Absolute Tsonga-ownage in that match. Reckon Djoker will become a competent volley-er? I think Djoker will become a competent volley-er working with Becker. I’d be surprised if that doesn’t happen because his net game is the pits. Didn’t see that one coming. I suppose Becker will help Djokovic with his net play. Alb, thanks for the interview. Fun to watch that again. Truth is, these two grunters, I mean, Nadal and Djokovic, are maxed out when it comes to using brute strength to hit through the other guy. So, skills like serve and volley, front court play, etc. will make a huge difference to the fortunes of either. I still think Roger will benefit the most if courts start demanding aggressive play. Q: You have a big French fan called Guy Forget. Two years ago, we asked what Federer should do to beat Rafa. He replied, “If Stefan Edberg was still playing he would beat Nadal 7 times out of 10” because you would make him a first serve and volley and then a second serve and volley, and that throughout the entire match. Do you think the same? Edberg: Clearly to beat Nadal, he should not play from the baseline. Because at this game he is the best. To beat him you have to attack, play a different game. I’m really surprised that Roger Federer does not play like that. At Wimbledon, for example, he came to the net once in ten. If I were his coach, I would have asked him to come to the net at least 7 times out of 10 against Nadal, just to break his rhythm. I think you do not have many players who play like I did or as McEnroe or Becker did in attacking first and second. It’s a shame because it is very difficult to play against someone who always breaks your rhythm and it’s very frustrating. But at the same time it is a very difficult game to play. Q: But do you think it is still possible to play like this, with the current grass, rackets and strings? Edberg: It’s got to be more difficult. I know they made balls slower, heavier. They cut the grass a little higher, so slower. It is therefore more difficult. It is a style of game that needs speed. The problem is, once Roger gets burned in a few points, he switches off the front court switch. He needs to be prepared to lose a few to Nadal because if he stops doing it, the less he comes to the net, the less comfortable he start feeling out there, which results in even less forays. It’s a vicious cycle. A lot of it has got to do with court conditions, racquets, etc. The type of looks the surface allows Nadal at a pass, it’s just not possible for Roger to deal with those dipping top spin shots at the net. Well, I have to say, with the racquet and string technology plus the much slower courts than from the Edberg time and before that, it´s simply not possible to play that kind of game anymore. The split second extra the players have extra to get to the ball on the serve, return it, and with the new strings and racquets the serve and volley player will be gunned down coming in on the second serve. I agree Roger could do it much more on his first serve, but not the second serve. We have seen that so many times go bad, Roger doing the second serve coming in and just being punished almost every time. But if the courts are made faster again then it´s a different story for sure. Speaking about how Roger could beat Nadal is such an old-fashioned debate that we all know the answer. Roger is not thinking about that, he is realistic. Hey guys, we all read that Novak has hired Boris Becker, but…. that is so dangerous for the rest of the players. I have read so many times that Novak is the perfect player, but lacks netplay. Now if Becker makes him unbeatable in that, will Novak not be completely unbeatable??? Great if you are a Novak fan, but what if you are not a Novak fan?? Dangerous times…….. I don’t mind. Whatever Becker teaches him, Novak will never have the same peRFect touch and control at the net as Roger. Besides, if Roger can’t win any more slams, I’d rather see Djokovic or even Murray add some to their collection. No more for Nadal please!!! Hi everyone, I just uploaded a video of Fed’s 16th slam triumph at the Australian Open 2010. It was made by Seven Sport (a TV channel), and I thought the video was beautifully made so I decided to upload it onto YouTube to share with you guys. It would be a dream to see Federer play like he did in this video for the upcoming Aussie Open. Thanks Conal. Where is the link? Hey Sid, better watch out, he’s also keen! Yes, that pairing makes a lot more sense because they are both natural volleyers but in case of Djokovic-Becker, there is so much room for improvement……it’s scary. I mean, Djokovic is scary as it, imagine what would happen if he has an improved net game! I don’t know Sid, I just never pictured Becker as a coach but I guess we’ll find out what impact he has on Novak. Whilst yes I do agree that Novak’s net game lacks, that wasn’t his biggest problem this year, Nadal was. Alysha, remember that deuce point at the French Open where he collapsed into the net? The one which was a gimme point that he so clumsily lost? The one that cost him the slam? He has serious issues at the net. That was a balance thing, Djokovic got too excited obviously and let his emotions get the better of him- that was unlucky what happened to him. Djokovic lost that match because he wasn’t mentally stable enough for the consistency of the match and Nadal was. I would disagree that Nadal was Djokers problem this year or that Djoker wasn’t mentally tough enough. The guy is unbelievably clutch. I mean he plays better when the pressure is at boiling point, check out some of his return games vs Nadal in that FO semi. His problem was lack of ability / refusal to end points when they could be ended. Has a tendency to go backwards rather than forwards. It nearly cost him USO 2011 vs Nadal but he was just too good that year, this year he stood still a little bit whereas Nadal improved. If Djoker could be confident volleying then he beats Nadal quite easily I think. Could be a good pairing if they get along and Becker doesn’t start chasing Jelena lol. Good points Jonathan, I saw Novak and Nadal live at the US Open this year and to me it felt as Nadal was intimidating Djoker big time because of that FO loss- that’s why I bring in the mental inconsistency here and there. But the main thing is that he responded well after that and ended the year unbeaten. Will Boris help Novak end points quicker? I don’t know, Djoker looks pretty set in his ways to stay on the baseline and it’s why he’s gained the success he has. Interesting season ahead that’s for sure. Just what I was going to post!! Definitely the new racket. I presume he would have switched back if he wasn’t keen on it. It’s too close to the Australian Open to switch back, in my opinion. The racquet looks a bit bigger to me…I could be wrong though. Here’s a pretty old training video, if you haven’t watched it already. It definitely is a different racket, that’s for sure. And I think it is far bigger than the 90. Fingers crossed. It looks like he´s really training hard. And for me it seems like there´s a lot more video material coming out than ususal? Yeah for sure new racquet. I honestly don’t mind Pablo commenting here because I never have a clue what he’s talking about. Something off topic. I was looking at photos of 3 yrs ago at IW. I have a photo of Berdych practicing without a shirt. Looking at him today….huge muscle mass increase. I can’t translate it in english : my german and english skills are basic…. Hey guys, I haven’t read the latest comments, will do that soon, but I just wanted to comment this that made me kind of mad: Saw today on Eurosport Matt Wilander’s “Matts Point 2013”. In this he ended with the remark that he thinks all the 4 finals of the 4 GS of next year will be between Rafa and Novak. So…….. should we just say to the rest of the players that they should stay home or that they otherwise just buy tickets to see 4 finals between Rafa and Novak?? He did not mention Andy, Delpo, the others, the youngsters or…. how about Roger?? Now Wilander is saying that Rafa and Novak will be playing the 4 GS finals…. Actually Mats Vilander is not anti Fed at all, I always watch slam tennis on eurosport where he´s plays a major role and over the years he has pais a lot of tribute to Federer and praise for his game. And he kept it up longer than most but unfortunatly Vilander has become more a journalist now than a tennis expert and has jumped the band wagon of chasing headlines and he is now more interested in Rogers age and retirement instead of actually looking at his game. I find Wilander hard to weigh up, changes his tune often. I think he’s fairly balanced though and gives credit when due, would be pretty poor if he was stupidly biased towards one player. If you go back to 04-07 then all commentators were constantly raving about Fed, now they talk more about Djoker and Dull which is fair game seen as though they’re winning more. I feel a lot of Fedfans throw shade at Wilander because of those comments he made a couple years back about Roger when it comes to Rafa. Either way I don’t mind his commentating, he’s quite objective and I’d rather him over those BBC trolls any day of the week. I don’t blame people picking Djokovic/Nadal to contend for slams next year, they are both in the prime of the careers and are dominating men’s tennis right now. Roger is the x-factor next year. Hey guys, wow so many comments… Actually, me, I really like Matt. I love his show (also Open Court by Pat Cash, I like that programme even more). Matt is very respectfull towards Roger. I listen to his comments on Eurosport. He is way better than some other commentators. But the thing I find dangerous is making such a big prediction. That Rafa and Novak will play all 4 GS finals. They might be in 1 or 2, but to think in all 4?? That has not even happen in 2011. All it takes is one guy (ofcourse the Goat) to ruin that. Even today when I saw Matts Points 2013 for the females, Matt ended with next year he thinks Serena will have her Serena Slam. I mean, you all know I am her fan, but even I don’t think she can win all 4. All it takes is a Sloan Stephens or your Sensual Sabine…. So that is my problem with Matt. He is a great guy. Nice and honest, but his predictions???? Nadal and Novak played 4 consecutive finals in 2011-2012 (Wimbledon 2011, USO 2011, AO 2012 and FO 2012) so it’s not imposable and can be predicted easily with the way both are playing right now. So I don’t see it bold prediction from Matts given all the facts. I wouldn’t pay to much attention to Mats Trollander Katyani. Hey Scooter, yeah I know. Love the name you gave him “Trollander”, but the best one is STILL Alysha’s “Dramadal” for Rafa !!! And you ask why Wilander said that???? Hey Pablo, what I meant was it is kind of a danger to make such predictions. Thats all. Nothing more. In 2011 Rafa and Novak played the most GS finals. I think they even could have played like 6 or 7 in a row, but it was Roger who stopped atleast one. That is what I meant. I really don’t take anything those guys say seriously….ie John McEnroe. No one has a crystal ball. So don’t worry Katyani….Brisbane is just over one week away! Hey Sue, yes finally. The Rogerless time will be over. Will you watch the Abu Dhabi matches??? Happy Christmas to you too Susie. Reckon he has a hit on Christmas Day?! Merry Christmas to all you Fed fans who I know are waiting for Brisbane to kick of the new season. Thus my christmas present to you all is the Australian open 2010 final with Federer vs. Murray. Many thanks Jonathan and all for keeping us Fedfans united. Lots of fun and cool being with your guys! 2014 a year of good health for all, enjoy the game of tennis, both playing and watching. A strong Tennis year with strong competition, exiting matches and Roger ending next year with at least a slam. Good luck to all , good luck to Fed with his new stick .Hope he beats some Spanish ( Serbian and British) a*s with it. Hope Jonathan keeps up with his good work. What else may I ask for the New Year? Not much I guess. Merry X’mass and a Happy 2014!!! Have you heard any official news that he´s going to make the switch to a new stick? Cheers Gambler, Merry Christmas to you too. Merry Christmas and Happy New Year to all. Thanks Jonathan for the great blog and thanks to all the bloggers the world over. And of course, thanks to Roger for his beautiful game. Merry Christmas Jonathan and folks! Here is Roger’s outfit for Australia. Wild shoes. Not a fan of the shoes, look like they were white and went through a colour wash.
Looks like Pinkerer aint coming to Australia this year. Love this polo though, vintage Fed (hopefully makes him play vintage as well aye?). 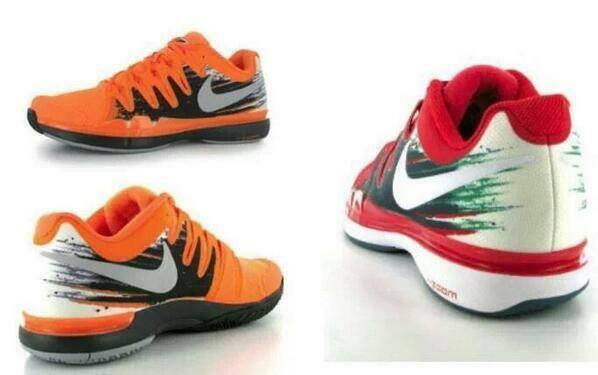 Agree with Jonathan on the shoes- Nike and Fed improving at the same time I guess? Like the polo! But wonder if it would go well with the shoes…? Well done, but I am curious and concerned in the same time on how you are going to destroy Nadal! Let us meet in 2014 in the chat room and witness toghether Roger winning some slams! Anyway see you all at Brisbane!